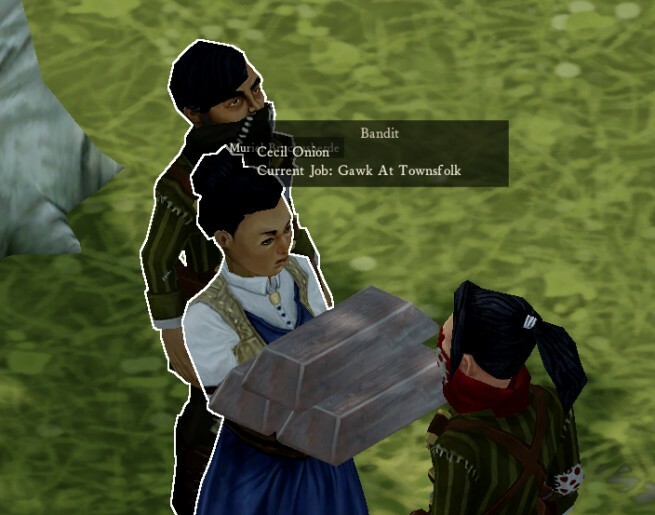 The current “meta” for Clockwork Empires experimental branch players is to ding up their relations with the Bandits by one point so they can be stay neutral and avoid Bandit attacks forever. This is a little too convenient, and entirely due to the Bandits not being fully integrated with the new faction code created since the implementation of diplomacy via the Foreign Office. So let’s make this fun. First, the Bandits need to work like the other factions. This has the happy effect of forcing Bandits through the code paths that the other factions use. The programmers out there get this – you want to pipe everything of like kind through the same function. From a player-facing mechanical perspective, this means the Bandits get the same 3 states – friendly, neutral, hostile – on the same -100 to 100 point scale that the foreign nations use. You can also interact with them similarly through the Foreign Office (which has indeed been working for Bandits some time now, though with slightly reduced functionality). All of this is mostly interesting from a development standing because it makes my job easy. How then are they different? 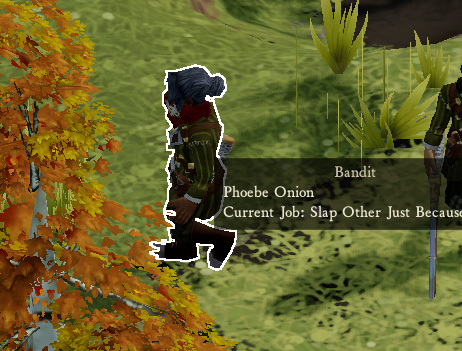 Well, Bandits are jerks. Not that the foreign nations might not be, but at least they play by the rules. In alphas 47 and 47A, you could get the Bandits in good relations then never worry about them again. 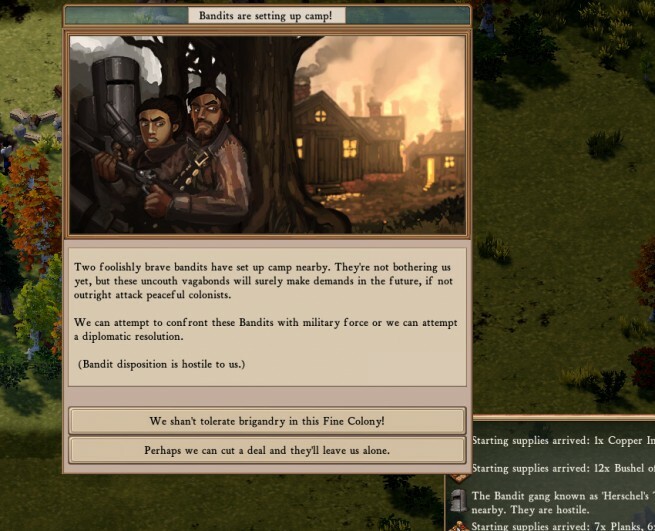 Not so anymore – it’s important that Bandits be somewhat demanding and unstable in their relationship with your colony. The whole point is that they’re a bunch of criminals who are used to taking what they want and pushing people around. They’re also heavily armed and sometimes armoured, which can be useful, but now you’re going to have to pay for establishing a working relationship with them. Phoebe, why would you even do that? Commodities. As a consequence of their greed and lawlessness, Bandits will still steal from you even when you’re on fairly good terms. You can, of course, demand a share of their general plunder. They’re used to doing business like this. Poor relations with other factions. Dealing with Bandits will harm your relationship with the Empire as well as the foreign nations. No upstanding government condones (open) dealing with the Bandits, so they will (publicly) disapprove of such acts. You may even be investigated for getting too friendly with the Bandits, and if caught take a bit hit to your standing with everyone else. There are however ways of making records disappear (fire, generally) – and you know what snitches get. Jerky Behaviour. If you’re friendly with Bandits, they’ll want to come visit your town. They’re poorly socialized, let’s say, and their rude manner may very well upset your colonists. Unreliability. You may do your bit and cover for the Bandits, let them steal a few logs now and then, and burn all the records when required. But they’re still undisciplined, unreliable friends, so just know that you can’t always count on them to do what you expect. Still, you learn to work with what you’ve got. And if you expect betrayal and are prepared to back your words with force, you may yet do alright. After all, a relationship with the Bandits can be useful. As mentioned, you can demand a cut of their plunder. They may also spy for you and assist you in combat against your enemies. And unlike the foreign nations and Empire they’re almost always nearby, for better or worse. What else is to come? Well, lots of this is much easier now that so much faction code is generic. 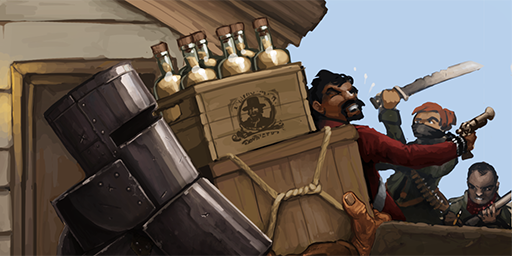 Bandits will soon trade via the Trade Depot and react more actively to actions other factions take – there’s a lovely implicit conflict between foreign traders and Bandits that shall be played up some more. (While at it, we should give foreign traders actual caravan guards to fight these Bandits.) — Well, now you know what I’ll be doing for the next week. Hurray for genericizing banditry faction code! Do you guys have any plans to improve hauling and material transportation? In addition to letting us expand our colonies into something more than tiny hamlets, it would also allow for bandits to conduct wheelbarrow based raids! That’d be nice, waiting for some far out lumber camp to get a load of logs to town and suddenly you get a bandit showing up: We took ye cart, you better get us ten bottles o booze or it might well get firey! You mention being prepared to back your words with might, so with the new, more fleshed-out bandit relations, is it possible to have hostile bandits who recognize that the player has significant military strength and is not to be messed with, or will waves of hostile bandits endlessly throw themselves onto our bayonets? Would being friends with bandits have any trade benefits, like access to black market supplies or some such? Also, are the bandits considered a single global faction, or is the relationship with individual bandit groups? 1. Each faction has a different list of trade goods it pulls from, so “kinda”. 2. Bandits are treated as a unified faction. Handling relations with multiple individual gangs would be … a big UI /micromanagement problem to solve. So far, though, I’ve been able to get individual camps hostile by firebombing them, while others were non-hostile (overall standing with the super-faction was friendly). This is hostile as “shoots your people” not as in “will attack your colony” though. As in, they’re not going to die, since they’re bandits to SURVIVE, and they’re jerks because that’s what pays their bills and fills their tummies with yummies. If I see Borderlands bandits with 0 regard for their life I will wiggle my finger. That being said, so much code for “i’m a baby imma run now’ is in place I should scold myself for doubting you in the first place.